TheBlueGuerilla: EXCLUSIVE: Lifelong Tories Revolt and Skip to UKIP - the Sajid Javid effect. EXCLUSIVE: Lifelong Tories Revolt and Skip to UKIP - the Sajid Javid effect. Geoff Brooking is a life-long Tory activist, both dedicated foot soldier and media contributor with daily letters to newspapers, writing regularly for local & national publications such as Daily Mail, Daily Express and theblueguerilla. This weekend life-long confidante Geoffers told tbg he was jumping ship and was defecting to UKIP. This came as a shock here at theblueguerilla and marks a pivotal turning point, in tbg's opinion, regards the state of the Tory Party. Question Time this past Thursday in-point, when Tory Economic Secretary to the Treasury and MP for Bromsgrove, Sajid Javid, spoke about the Tory Party not making "unfunded tax cuts" like a New Labour lackey. This was followed by Nigel Farage quite rightly correcting the spokesman on actual Tory tax cutting philosophy - It creates greater wealth thus higher indirect tax revenues. This was entirely embarrassing for Sajid Javid, he has been cowed by Left-wing myths and lies. And had Tory grassroots dumbfounded. 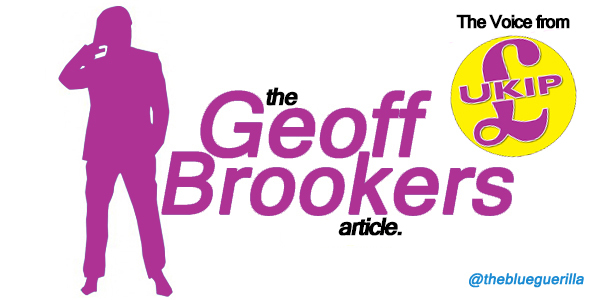 Today, life-long Tory activist Geoff Brooking writes his first article for tbg as a member of UKIP. "Why we Should Respect the Fact That we Live in a Democracy"
"The news that the Conservatives are launching personal and smear campaigns against UKIP candidates in regards to this year's County Council elections is pretty desperate stuff and simply underlines how David Cameron wants the focus to be as far away from policy as possible. "After all, this is the Prime Minister who promised an EU Referendum and failed to deliver, promised to scrap the Human Rights Act and failed to deliver and even promised a British Bill of Rights and failed to deliver. As a result the economic recovery has all but stalled thanks to the continued European Union bureaucracy, we still have fanatics like Abu Qatada still at large and about as much chance of having an EU Referendum before 2015 as seeing man land on mars. "As Deputy Leader of UKIP Paul Nuttall tells today's Sunday Express: "Isn't it sad that Conservative Central Office has nothing better to do than smear people?" "OK not every UKIP candidate may be perfect but let's not forget that only last week a Sussex Tory Councillor was expelled from the party, a Lib Dem was imprisoned for planting bombs under cars, and even some of Labour's own team are former BNP activists. "So to throw dirt at people who are only wanting to serve their communities simply proves to me that Cameron knows he has got it wrong on Europe, knows it is costing him activists by the bus load, and proves that Downing Street is in a panic of its own making." David Cameron has never promised an in/out EU referendum and failed to deliver it. The "cast iron guarantee" remark was about a referendum on the Lisbon Treaty if there was a majority-Conservative govt before it was signed. Throwing dirt? If UKIP don't want the views of their candidates communicated to the public then they have no place in politics. They want to play with the big boys but still have a lot of growing up to do. The bottom line is this: A party has emerged which has the interests of Britain at heart. If you are a conservative you are, unwittingly or not, supporting wealthy British business owners, landlords and bulk shareholders who naturally want more people here. More people means more customers, higher rents and cheaper labour. It also means over burdened schools, NHS and prisons - all of which are a burden to the tax payer. Fine if you can avoid paying tax, which the wealthy can. It is time to stop bowing and scraping. Time to stop pandering to those who can create jobs, just because they can create jobs. A decent government could create full employment in this country - at a stroke, if they had a mind to. How are these attacks against UKIP candidates "smears" when they are all true? UKIP's response this weekend just smacks of immaturity and is quite frankly puerile. Is it ok for UKIP to go around painting themselves as whiter than white, and as a bunch of honest and well grounded people? Whilst simultaneously labelling the other parties as "all the same", and a bunch of liars who are all on the make? Then they expect them to just sit there and say nothing? If you poke a bunch of sleeping giants in the eye enough times don't act so surprised when they wake up to you and take a swipe back. Joining an authoritarian party full of bigots, homophobes and racists? Nice. Hope you enjoy the political fringes of nothingness. I'd like to remind you, on tax btw, that Farage threw the flat tax idea out the window on that same episode of QT. At least the Tories HAVE policy. UKIP just pander to whatever sounds best at the moment. If you throw your toys out the pram just because things are not going your way so easily maybe UKIP is all you deserve. But ask yourself how much you think you will achieve there. Bugger all. haha, what a fool! People only vote UKIP because they hate gays and immigrants, not because they want a low tax small state system. Jeez, half their voters favour some of the most socially authoritarian attititudes we've seen in decades in this country!. UKIP may be the biggest barrier this country has to leaving the EU.